Former The Only Way is Essex Star, Carol Wright was full of festive cheer on Saturday 25th November as she joined a seasonal attempt to create a new world record at The Liberty Shopping Centre in Romford. Dressed in a festive Christmas jumper from Debenhams, glamorous Carol joined dozens of other Carols from across the country to create a brand new world record for the largest number of ‘Carols’ singing Christmas carols together. The band of carolling Carols were lead in seasonal song by musical director, Rebecca Amissah, who recently performed on Sky One show Sing: Ultimate A Capella hosted by Cat Deeley. 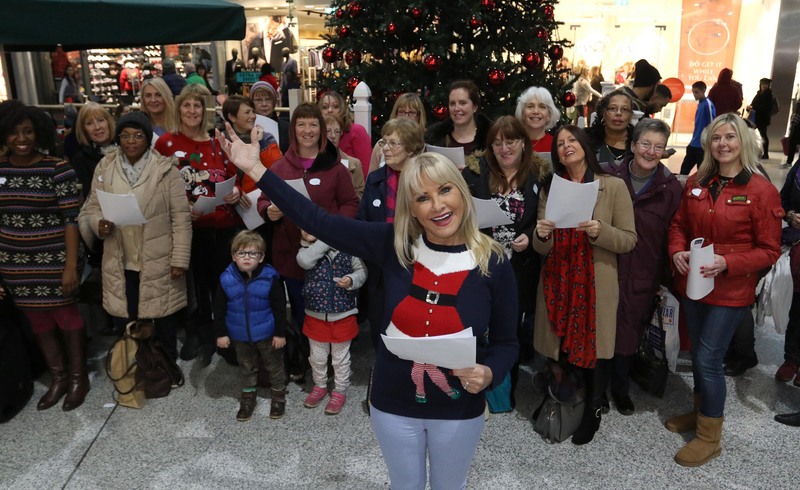 TOWIE stalwart Carol was seen cheerfully belting out festive favourites including ‘Hark The Herald Angels Sing’, ‘Rocking Around The Christmas Tree’ and ‘We Wish You A Merry Christmas’ under the shopping centre’s Christmas tree, before drawing the winner of two prize draws arranged by the centre to reward the attempt participants. Carol Ben Yosef from Chigwell was the first lucky ‘Carol’ out of the hat, winning a donation of £1,000 to her chosen charity Chigwell Riding Trust For Special Needs, while Carol Ansted from Harold Hill, Romford won a £250 gift card to spend at The Liberty. Carol Wright, 57, said: “All of my fellow Carols were in fine voice and really got me in the seasonal spirit. Centre manager, Jonathan Poole, added: “We believe that this is the largest ever gathering of ‘Carols’ joining together in festive song at the same time. Carol Ben Yosef, winner of the £1,000 charity donation added: “When I got here, I thought, what am I doing? I was a bit nervous.